This album reached #72 on the Billboard Charts. If you have heard Nuffy on the Midwest Funk Soundtrack, Midwest Funk Volume 2 and the Fakin Da Funk movie soundtrack (starring Tayana Ali, Pam Grier, Neil Carter, John Witherspoon and others),then you are ready for the solo debut by Nuffy, entitled For My Protection.This album shows a lot of versatility from club hits, rough cuts and even a rap ballad. Nufffy has reached magazines and the airwaves overseas and across the U.S.A.. The album For My Protection also hit #72 on the billboard charts. 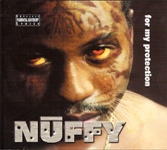 Nuffy: For My Protection - Click Here To Listen!